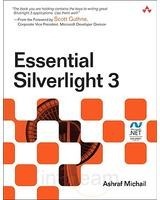 I recently finished reading “Essential Silverlight 3” book from Ashraf Michail (Addison-Wesley). This book provides an incredible level of details on the UI part (graphics, animation, effects, text, media) of Silverlight. “Under the Hood” sections present very (too?) deep information of the Silverlight UI architecture that you won’t find in other books. So it is a good reading for advanced Silverlight developers focusing on graphics and layout optimization. I would NOT recommend it for beginners, intermediate or business app developers. If your goal is to quickly understand Silverlight 3 and all its features you will easily find more appropriate books for that purpose. Data driven application developers will only be interested by the data binding chapter, so don’t bother opening this book.